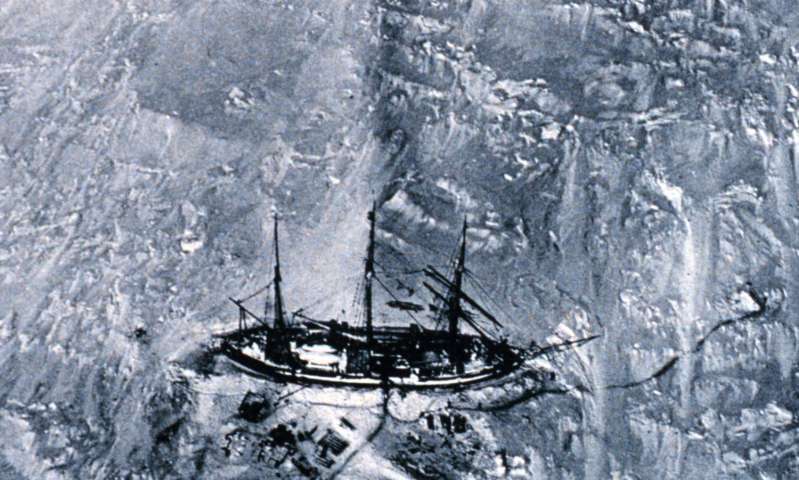 Ice observations recorded in the ships' logbooks of explorers such as the British Captain Robert Scott and Ernest Shackleton and the German Erich von Drygalski have been used to compare where the Antarctic ice edge was during the Heroic Age of Antarctic Exploration (1897-1917) and where satellites show it is today. The study, published in the European Geosciences Union journal The Cryosphere, suggests Antarctic sea ice is much less sensitive to the effects of climate change than that of the Arctic, which in stark contrast has experienced a dramatic decline during the 20th century. The research, by climate scientists at the University of Reading, estimates the extent of Antarctic summer sea ice is at most 14% smaller now than during the early 1900s. Jonathan Day, who led the study, said: "The missions of Scott and Shackleton are remembered in history as heroic failures, yet the data collected by these and other explorers could profoundly change the way we view the ebb and flow of Antarctic sea ice. "We know that sea ice in the Antarctic has increased slightly over the past 30 years, since satellite observations began. Scientists have been grappling to understand this trend in the context of global warming, but these new findings suggest it may not be anything new. "If ice levels were as low a century ago as estimated in this research, then a similar increase may have occurred between then and the middle of the century, when previous studies suggest ice levels were far higher." The new study published in The Cryosphere is the first to shed light on sea ice extent in the period prior to the 1930s, and suggests the levels in the early 1900s were in fact similar to today, at between 5.3 and 7.4 million square kilometres. Although one region, the Weddell Sea, did have a significantly larger ice cover. Published estimates suggest Antarctic sea ice extent was significantly higher during the 1950s, before a steep decline returned it to around 6 million square kilometres in recent decades. The research suggests that the climate of Antarctica may have fluctuated significantly throughout the 20th century, swinging between decades of high ice cover and decades of low ice cover, rather than enduring a steady downward trend. This study builds on international efforts to recover old weather and climate data from ships' logbooks. The public can volunteer to rescue more data at oldweather.org. Day said: "The Southern Ocean is largely a 'black hole' as far as historical climate change data is concerned, but future activities planned to recover data from naval and whaling ships will help us to understand past climate variations and what to expect in the future." Capt Scott perished along with his team in 1912 after missing out on being the first to reach the South Pole by a matter of weeks, while Shackleton's ship sank after becoming trapped in ice in 1915 as he and his crew journeyed to attempt the first ever cross-Antarctic trek. In addition to using ship logbooks from three expeditions led by Scott and two by Shackleton, the researchers used sea-ice records from Belgian, German and French missions, among others. But the team was unable to analyse some logbooks from the Heroic Age period, which have not yet been imaged and digitised. These include the records from the Norwegian Antarctic expedition of 1910-12 lead by Roald Amundsen, the first person to reach both the south and north poles. Would ice coverage around Antarctica be affected by the amount of meltwater? Since fresh water is less dense and freezes at a higher temperature then ice coverage may be similar to previous decades even as the ice shelf is thinning. Temperatures at the North Polar region, instead of being well below ZERO....reached freezing and above. Described as "freakishly warm". 2016 broke the HISTORIC SATELLITE LOW ICE LEVEL! Previously Set in 2015. Continuing the 40++ year trend in lower ice. Gravity—yes, gravity—is the latest victim of climate change in Antarctica. That's the stunning conclusion announced Friday by the European Space Agency. "The loss of ice from West Antarctica .... caused a dip in the gravity field over the region," writes the ESA, whose GOCE satellite measured the change. Apparently, melting billions of tons of ice year after year has implications that would make even Isaac Newton blanch. This doesn't mean too much, not that the Earth is going to tilt or something, just that we can actually measure minute changes in gravity. Not need to panic about this.